Relax and revive in Ruby’s Spa. Guests revel in the spa's comfortable decor – warm hardwood floors, a natural palette, original artwork by the McMenamins artists and more echo the surroundings of Edgefield's main lodge. Our trained staff offers manicures, pedicures, massage, body treatments, make-up application, hair styling and more in comfortable treatment rooms. Schedule an appointment to get all gussied up before a big date, or spend the entire day getting a complete makeover before your wedding. We'll even serve you refreshments, if you'd like. 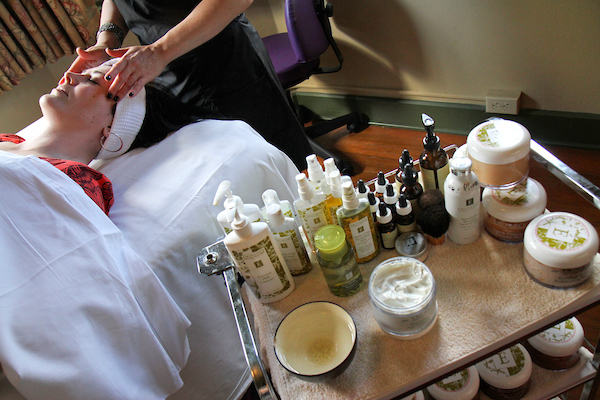 The spa is pleased to offer an array of luxurious products with an emphasis on natural resources. We carry the acclaimed Eminence Organic product line from Hungary, among other fantastic products. Ruby would surely approve. The true sparkle to this gem is surely the outdoor, heated soaking pool, open exclusively to overnight hotel guests and those with spa appointments. The pool is filled with gently heated soft-and-buoyant saltwater that's free of chemical treatments. Unwind and relax before retiring to one of Edgefield's comfy guestrooms. Please note: The soaking pool is reserved for guests with overnight hotel reservations or spa appointments only. This targeted treatment is a non-surgical alternative to more invasive procedures. The amino acids instantly firm, lift and plump skin to reduce the appearance of fine lines. This skin-quenching treatment provides intense hydration. The Rejuvenate Serum contains vitamins and antioxidants that dramatically lift, tone and hydrate all skin types. Results are instant, showing a more defined facial contour. Get the best of both! For even more remarkable results, allow the powers of the above treatments to combine and reduce the appearance of fine lines and wrinkles while tightening and firming for more defined facial contour. Using botanical skin brighteners and concentrated Vitamin C, we brighten the skin's appearance. Using fruits, herbs and spices, a thorough cleansing, exfoliation, masque and soothing facial massage performed by a trained esthetician will make your skin shimmer and glow. The ingredients will change with the season, to provide you with the freshest potion possible. Let Mother Nature help cleanse and refine your complexion with healing, antibacterial element such as Hungarian mud, clays and more, custom blended for those with acne-prone or reactive skin. Our licensed estheticians will give you suggestions on specially designed products and instructions to further treat your skin at home. This anti-aging treatment addresses the skin's loss of elasticity and environmental damages. Loaded with potent organic vitamins and rich plant greens, your skin will be lifted, toned and rebalanced. You'll feel revitalized, radiant and perhaps even years younger. Experience the warmth of the sun and the coolness of the moon - the natural acids of fresh apple and grape pulps blended with paprika and other warming herbs act as natural exfoliants and stimulating detoxifiers, while a chilled organic masque soothes your skin 'til it's illuminated. Your complexion will glow after a series of natural, organic enzyme peels, designed to produce the best results without the irritation of traditional chemical peels. Our blend contains fruits and vegetables rich in enzymes and acids that gently dissolve dead cells and even your skin tone. Please note: This treatment is available in a series of four; a consultation is necessary prior to the service. Using exotic spices, fruits and vegetables, this back treatment will increase circulation and cleanse and exfoliate your shoulders and back, specific to your skin's needs. Finally, aromatic body butter will be smoothed into your skin so you're refreshed and glowing. We'll refine the tender skin on your back using natural products, specific to your skin concerns. A healing blend of fresh fruits and vegetables will be used to cleanse and exfoliate your skin, while treating breakouts at the source. Finally, enjoy the luscious scent of a whipped moisturizer that will keep your skin hydrated and clear. Relax and destress as a raspberry, naseberry, cucumber and wild plum blend is used to gently exfoliate and stimulate your eye area, reducing puffiness and dark circles. A pressure point massage gently eases away any remaining signs of stress. A soothing application of argan oil worked into the head and scalp providing deep levels of relaxation. Experience the indulgence of wildflower essences in a base of sweet almond and jojoba oil worked into the face to provide relaxation and protection from environmental stressors. Natural, seasonal ingredients are used to scrub, wrap and soothe your entire body from head to toe. Simply wonderful. Done a bit too much celebrating lately? In this treatment, we'll use natural products to scrub and wrap your body while harmful toxins are drawn out. Then, after the product removal, your skin will be soothed with a calming finishing lotion. It'll help cure what ails you. The technician begins with a light Jasmine Green Tea cleanse. This is followed by a coarse sugar scrub for exfoliation, and soothing warm towels. After removing the scrub, a body butter is applied to fully moisturize the skin. Luxurious oils are used with gentle massage techniques to assist with stress relief and muscle aches. Our skilled therapist will incorporate different techniques to make your experience unique. 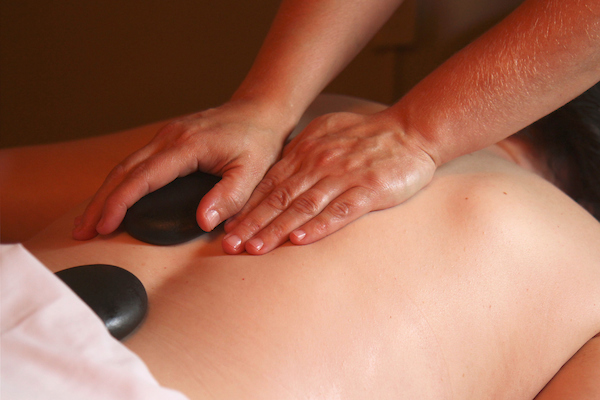 Warm basalt stones and rich oils create a truly relaxing massage. The heat of thermal stones releases tension along the body's pathways (spine, shoulders, legs and back). Your therapist will then use the stones with massage techniques to rebalance and renew your energy. Incorporating the healing powers of custom-blended aromas, this massage will take you to a dream state of relaxation. Soothing, kneading and stretching massage strokes will leave you thoroughly rejuvenated. Feel your body give a sigh of relief as tension bound deep within your muscles is released with this powerfully effective treatment. Organic oils and therapeutic massage provide intensive therapy for muscles, joints and ligaments. Designed to pamper the expectant mother at any stage of pregnancy, we offer gentle relief from the natural tension and physical demands of pregnancy, while restorative oils nourish and soothe overworked skin. Try a side-by-side appointment, where you'll both be treated to a massage by two trained therapists. Let them knead, ease and relieve tension as you and your partner enjoy each other's company. Deep release of myofascial tissue. Relax, refresh and revive your tired feet with a foot soak and massage. an exfoliation and a soothing paraffin wax treatment. Soothing relief for tired hands and forearms; our therapists will use focused massage techniques to work out the kinks in your muscles. As an added benefit, they'll work in a sugar scrub and paraffin wax to leave your skin soft and moisturized. Please note that sitting in the soaking pool after a nail treatment will cause your polish to bubble; we suggest you arrive early to enjoy the pool before your treatment. Nails are filed and smoothed, cuticles tidied and skin exfoliated, softened and massaged. Finally, a warm mitten or boot wrap deeply conditions your skin. Finish with a nail buff or polish of your choice. In a bit of a hurry? Then enjoy the benefits of our express nail services that uses seasonal products from a changing menu. Nails are trimmed, cuticles are tidied and your skin is lightly massaged. Finish with a nail buff or polish of your choice. Shellac is a nail color treatment that is applied like a polish and set under a UV lamp, resulting in an instantly dry color that lasts for up to two weeks. a 45-minute Ruby's Express Pedicure. Need some serious pampering and luxury? Then this is your package. Begin with an hour-long Ruby's Spa Massage. Next, enjoy a lavish 90-minute Sun & Moon Facial, followed by an Edgefield Manicure and Pedicure. Includes lodging for two, two 60-minute spa treatments (choose from below), along with breakfast the next morning. Please call the hotel for rates and reservations. to leave your skin tight and smooth. Your nails will be filed and shaped, removing rough edges and cuticles. This foot massage also includes an exfoliation and a soothing paraffin wax treatment. Feel your body give a sigh of relief as tension bound deep within your muscles is released with this powerfully effective treatment. Let us cleanse, exfoliate and moisturize your visage so it's soft, smooth and refreshed. We strongly encourage you to schedule trial runs for your hair and makeup before your big day. The most memorable day of your life deserves a memorable look, starting with beautifully-designed hair that complements your dress. We also offer a selection of hair accessories sure to dazzle you. One-hour intraceutical oxygen treatment, an Edgefield Manicure & Pedicure and bridal hair and make-up, with a pre-wedding day trial run included. An Edgefield Manicure & Pedicure and bridal hair and make-up, with a pre-wedding day trial run included. A Ruby's Express Manicure & Pedicure, an updo and make-up application. 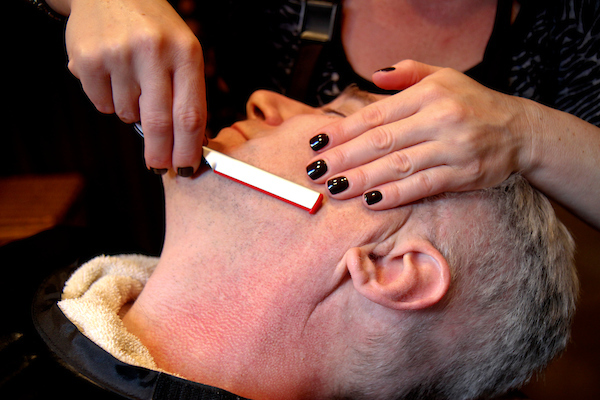 One-hour Ruby's Spa Massage, a Shape & Buff for your nails and a Hot Towel Shave. A FEW THINGS TO NOTE . . .
the greatest availability of services. We require a credit card to secure your spot. to pay the full price for shortened services. Please shower prior to any treatment. you may choose to leave undergarments on during your services. changes made with less than 24 hours notice. No-shows are charged the full-service price. you are pregnant or have a medical condition, certain treatments are not recommended. to enjoy the soaking pool.